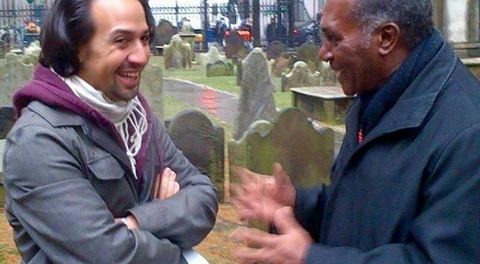 Premier Vance Amory in animated discussion with genius behind the smash Broadway hit Hamilton, Lin Manuel Miranda. News America, NEW YORK, NY, Weds. Jan. 11, 2017: Nevis Premier Vance Amory will lead a number of officials from his country in a 260th anniversary tribute to the islands most famous son – America’s greatest immigrant and founding father, Alexander Hamilton. 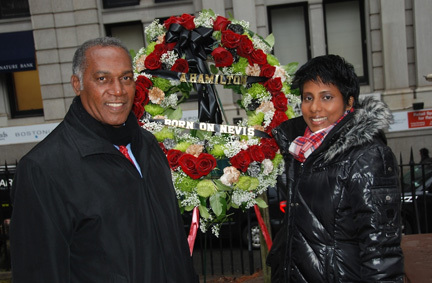 The event is set for 2 p.m. today, Jan. 11th at the gravesite of Hamilton at Trinity Church yard in lower Manhattan. Amory returns to the event after attending in 2014 and will attend today with Everson Hull, St. Kitts and Nevis ambassador to the Organization of American States; Evelyn Henville, a Hamilton scholar and former director of the Nevis Historical and Conservation Society, and Devon Liburd of the Nevis Tourism Authority and the Hamilton Museum. They will join members of the Alexander Hamilton Awareness Society and the Bowling Green Association, sponsors of the event. Hamilton was born on January 11, 1757 in Charlestown, the capital of the island of Nevis in the Leeward Islands. He went on to become was an American statesman and one of the Founding Fathers of the United States. He was an influential interpreter and promoter of the U.S. Constitution, as well as the founder of the nation’s financial system, the Federalist Party, the United States Coast Guard, and The New York Post newspaper. As the first Secretary of the Treasury, Hamilton was the main author of the economic policies of the George Washington administration. He took the lead in the funding of the states’ debts by the Federal government, as well as the establishment of a national bank, a system of tariffs, and friendly trade relations with Britain. His vision included a strong central government led by a vigorous executive branch, a strong commercial economy, with a national bank and support for manufacturing, plus a strong military. Hamilton was also active in ending the international slave trade. He crusaded against Vice President Aaron Burr who was running for governor of New York State in 1804. Burr took offense and challenged him to a duel. He mortally wounded Hamilton, who died on July 12, 1804. His life is today celebrated in the 2015 hit Broadway musical ‘Hamilton’ the musical, which features music, lyrics, and a book by Puerto Rico-roots artist, Lin-Manuel Miranda, based on a biography by Ron Chernow. In 2016, Hamilton received the Pulitzer Prize for Drama and a record 16 Tony nominations, winning 11 of them including Best Musical.